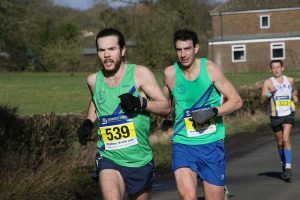 THERE were no fewer than 22 personal bests on the weekend the road-racing season got into full swing at the club’s flagship occasion, Bramley. Pride of place went to Brendan Morris, our second finisher in the 10-miler behind the returning Keith Russell, with a time of 58mins 11secs. Brendan was 11th overall, just ahead of another Irishman, Dave McCoy, who also dipped under the hour. Our trio also picked up the silver medals in the team event. The big pb in the 20-miler was bagged by Seb Briggs, fourth overall in 1:56.40. Seb cleaned up at the prize-giving, taking the MV40 category prize with more than 10 minutes to spare and then carrying off the second-place team award with Alex Warner and Lance Nortcliff. 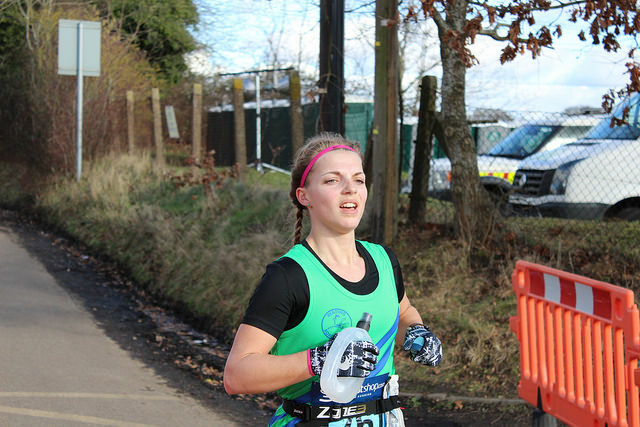 New international Caroline Hoskins started the season as she means to carry on, slashing a minute off the 12-year-old course record for 20 miles in a new pb time of 2:14.22. Carrie, who will wear an England vest for the first time in May, finished fifth lady overall and took the FV50 age group award with more than 12 minutes to spare. Our first lady home at 10 miles was Jane Davies in 1:11.01, a time comfortably good enough to capture the FV50 prize. Jane also led Helen Pool and new member Katherine Foley to third prize in the ladies team award for the shorter distance. 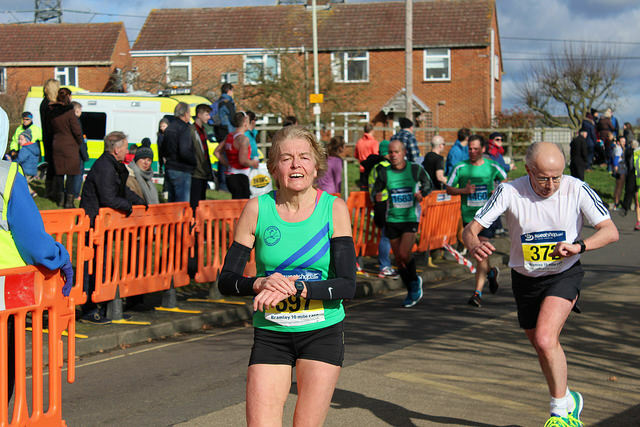 Hopefully this is a definitive list of the PB’s from the 20-miler, in the order of finishing: Briggs, Paddy Hayes, Katherine Sargeant, our top man’s wife Loretta Briggs, the superstar’s daughter Sophie Hoskins, David Walkley, Dave Brown, Paloma Crayford and Sarah Richmond-De’voy. Missing altogether from the results submitted to the club newsletter was Peter Manning, who finished 305th in a time of 2:45.52. In the 10-miler the new best marks were set by Morris, Gareth Goodall, Vince Williams, Sam Whalley, Nicola Gee, Chloe Lloyd, Maria Norville, Zoe De La Pascua, Jenny Boxwell, Helen Dixon and Sarah Walters. Sadly, your correspondent scored a notable double of a personal best followed by a personal worst at the weekend. The best (usual corny joke coming up) was in the Bramley 20, for the very good reason that it was my first time over the distance. The worst was in presenting the results for the club newsletter straight after the event. New editor Peter Reilly was anxious to make a good fist of his first edition, giving a very good impression of Tom Hanks playing the boss of the Washington Post, so copy deadlines were tight. And he wanted a couple of reports on the race, plus a write-up of the club’s Hampshire League success, on the final whistle. A lot to do… and I’m afraid I made a bit of a pig’s ear of the stats. This data is always provisional for some considerable time afterwards, but that’s no excuse to my sins of omissions. Apologies if the newsletter listings appeared with some members missing altogether and several personal bests not acknowledged. I knew things were going badly when I saw David Ferguson post on Facebook that he had achieved a pb. I’m afraid he wasn’t in the original results at all and, consulting the bible that is Power Of 10, he’s still not! Then I saw a picture on a Flickr album of Claire Woodhouse crossing the line, but I knew I hadn’t spotted a time for her, either. For the record, Claire’s time for 10 miles was 1:23.14 for 257th place and I think I also missed Martin Douglas, 288th in 1:24.25. A time for June Bilsby, a late swapper between the two distances, must remain one of the great imponderables. As ever, your best chance of getting your name up in lights is to mail your race details to results@readingrunners.org as soon as possible after races. Simple as that. You can also post in on the club’s Facebook page, send it to my personal email account, text me, tweet it or send it by pigeon. But results@readingroadrunners.org gets the job done. 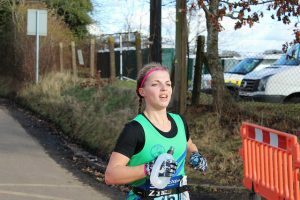 There was also a pb at the weekend for Kerry Eastwood at the Worthing Half Marathon. Tip for recognition, Kerry: Enter your races as a Roadrunner! Pictures kindly supplied by Barry Cornelius. 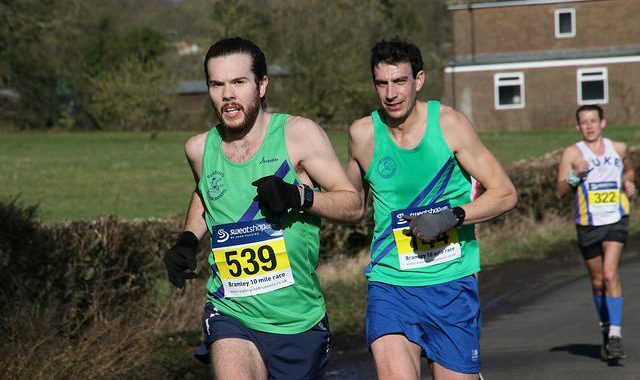 Posted in Dibben Report, Jan-March 18, Race Reports, Roadrunners18.